Photos Copyright © Patrick Ross. Captions by Patrick Ross. My friend Patrick Ross from The Artist’s Road blog recently returned from a family vacation in central and western Virginia. 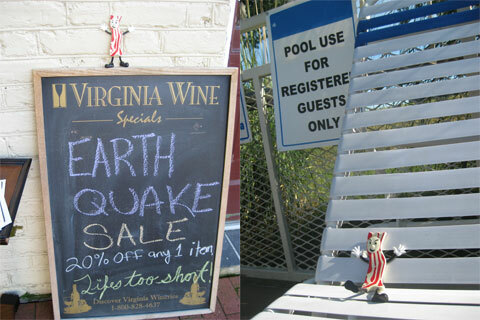 Throughout the trip his travel companion, Mr. Bacon, seized every opportunity to upstage the local signage. 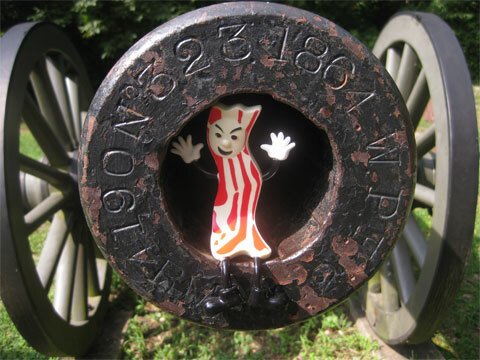 Were Mr. Bacon to be fired from this Confederate artillery, would he already be completely cooked upon landing? Patrick’s is the only blog I know where the word ‘bacon’ can be seen in the tag cloud. Some might call it a food obsession, but Mr. Bacon has now become a celebrity in his own right (or in his own mind). I’ve heard rumors of a rock star attitude. the earthquake. I didn’t buy him any wine, he’s a lightweight. he just takes a quick dip in the pool. See more fun pix in Mr. Bacon’s slide show on Patrick’s blog. You can also read Patrick’s thought-provoking post, When I Unplugged from the Grid, where he weaves his thoughts about disengaging from social media into an account of the time he spent with his family on vacation. 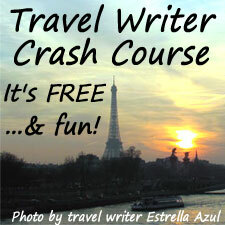 Mr. Bacon’s travel companion and photographer, Patrick Ross, is a writer in Washington, D.C. He is a former reporter, editor, artist advocate, think-tank senior fellow, veterinary assistant, short-order cook, and telemarketer (if he ever called you pitching a carpet-cleaning service, he apologizes). 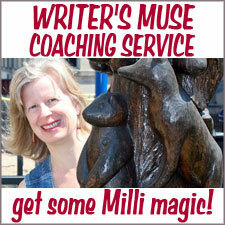 Patrick blogs on creativity and writing at The Artist’s Road and tweets as @on_creativity. Too funny! You crack me up. You realize Mr. Bacon will probably soon be demanding his own blog. . . . I love it! It reminds me of two things – Flat Stanley for school kids (but WAY cooler) and there was this guy who took this mini troll doll to every disney trip (years ago). Mr. Bacon is pretty cool….He SHOULD have his own blog!